La Timpa wears LEWIS LEATHERS ARCHIVE vest, VAQUERA corset, GIVENCHY hoop earring with cross, model’s own hoop earring, MOWALOLA ring necklace, CONTEMORARY WARDROBE padlock necklace, VAQUERA jeans, UNDERGROUND belt (top), ROKIT belt (bottom). Klein wears SLIM BARRETT necklace (worn from nose to ear), GIVENCHY hoop earring with cross, stylist’s own choker, VAQUERA shirt, FLEET ILYA harness. Emmanuel wears LEWIS LEATHERS ARCHIVE vest, RELLIK vintage briefs and belt, EDUN leggings, GIVENCHY hoop earring with cross, MOWALOLA chain earring, stylist’s own choker, SLIM BARRETT chain necklace (with added safety pins), CONTEMPORARY WARDROBE padlock necklace, UNDERGROUND cuffs, NORTHSKULL ring, CHARLES JEFFREY LOVERBOY boots. Emmanuel wears vest and jewellery as before. 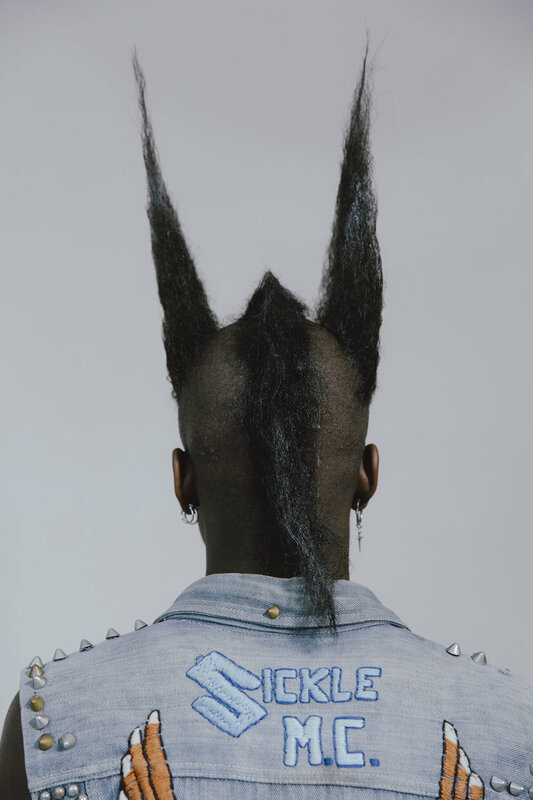 Olabisi wears LEWIS LEATHERS ARCHIVE jacket, DEBORAH MARQUIT bra, GIVENCHY earring (with added safety pin), SLIM BARRETT necklace (with added safety pins). Klein wears VAQUERA shirt, FLEET ILYA harness, necklace, earring and choker as before. Jay Jay wears LEWIS LEATHERS ARCHIVE jacket, CONTEMPORARY WARDROBE vintage shirt, JUSTINE CLENQUE earring (with added safety pins), CONTEMPORARY WARDROBE jumper, SLIM BARRETT necklaces. Emmanuel wears as before. La Timba wears vest, corset, earrings and necklaces as before, VAQUERA jeans, UNDERGROUND belt (top), ROKIT belt (bottom). Jay Jay wears jacket, shirt and earring as before, CONTEMPORARY WARDROBE jumper, SLIM BARRETT necklaces. Olabisi wears safety pin as earring. La Timpa wears vest as before.